3-Dimensional Services was able to increase uptime and improve quality for Freed's with this new design of a production cupcake icing tool. 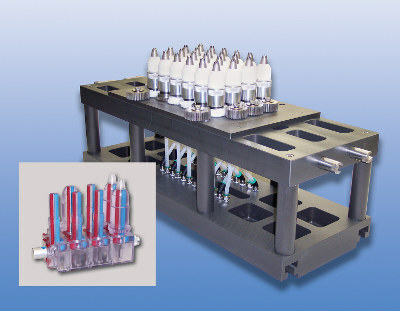 Inset photo shows an SLA model developed by 3-Dimesional Services to prove out the design concept. For most of us, cupcakes are a pleasant treat, perhaps a momentary diversion. For Freed's Bakery, though, cupcakes are serious business. And big business. That's because Manchester, NH-based Freed's, a division of Maplehurst Bakeries, Brownsburg, IN, is one of the largest cupcake makers in the U.S. Freed's supplies in-store bakeries with both iced and un-iced cupcakes in a variety of sizes, flavors, colors, and with packaging to suit occasions ranging from kids' birthdays to sporting events, and nearly everything in between. Recently, however, they were faced with an unusual problem. Their two-color icing tool was nearing the end of its useful lifespan. This is a complicated mechanism that applies precisely the right amount, pattern, and color of icing to the product on Freed's main automated production line. Ordinarily, obtaining a replacement tool would be a routine matter -- just order another icing tool from the manufacturer. Trouble was, the manufacturer had discontinued this particular line and was no longer servicing it, so a routine matter threatened to become a major production roadblock. For a solution, they turned to a firm with a reputation for advanced, high-tech production and design capability coupled with old-fashioned, can-do engineering skill: 3-Dimensional Services Group of Rochester Hills, MI. 3-Dimensional Services is a rapid prototyping firm that specializes in the design, engineering and analysis, in-house tool construction, and complete build of first-off parts and low- to medium-volume production runs. The company's use of advanced process methods and manufacturing technologies means prototype parts are typically provided up to 70% faster than conventional prototype shops are able to offer. "The first hurdle we faced was the fact that there were no available CAD drawings for this tool," says Dave Kraicji, operations director for the Rochester Hills firm. 3-Dimensional Services responded by reverse-engineering the tool: disassembling it, dimensioning the components, and drawing them in order to create a CAD file for use by one of its stereolithography (SLA) machines. SLA is one of four rapid prototyping technologies employed by 3-Dimensional Services, the others being laminated object manufacturing (LOM), selective laser sintering (SLS), and metal laminating. Each technology produces a solid working model of the design, critical for hands-on review of form, fit, and function, with the choice of prototyping technology governed by the specific needs of the application. "The entire process, from receipt of the tool, through reverse-engineering, to creation of the design model, was accomplished in a week," says Kraicji, with understandable pride. The model of the design was inspected and approved by Freed's, and 3-Dimensional Services rapidly built and delivered the replacement tool. This mission-accomplished moment could well have been the end of the story, but it was more like the beginning. That's because during the discussion that occurred during this project, Freed's revealed that they weren't completely satisfied with their existing design. 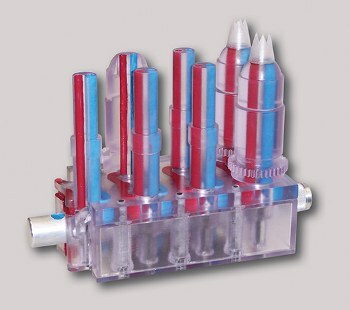 For one thing, though this two-color icing tool was highly productive, it was too heavy to be used on any but Freed's most heavy-duty machine. Ideally, they would have liked the flexibility to employ it on other machines as well. It was also a very complex mechanism, which meant that periodic maintenance was time consuming. In addition, it sometimes had problems with icing leakage. For its part, the 3-Dimensional Services team wasn't completely satisfied with the original design either. To the team's experienced eyes, the reverse-engineering process had revealed several areas where the design could be improved. They broached this subject to the customer, and Freed's gave the team the green light to try and create an improved design. With Jerry Eversole, senior designer/CAD operations manager heading the effort, the 3-Dimensional Services team set to work. For starters, there were the hoses. These conducted the icing from the mixing vats to ports in the nozzles, with two hoses feeding each port. Trouble was, long exposure to the strong, food-industry-strength cleaners used on the machine left the hoses brittle and susceptible to breakage; replacing them, though, was difficult and time consuming. "With the old design," says Kraicji, "each time a hose broke, the client had to remove all of the hoses that stood in the way of the failed hose. This included removing each hose's hose clamps. Since hose failure was not a rare occurrence, this was a major source of downtime." 3-Dimensional Services responded by cutting a runner system into the aluminum plate of the tool's interior to facilitate the flow of icing. This enabled the team to eliminate 24 of the tool's 48 hoses, slashing in half the potential number of hose-breakage incidents. In addition, they replaced the conventional hose clamps with nickel-plated brass quick-connect fittings that were significantly faster and easier to attach and reattach. Also, a new hose arrangement enabled maintenance personnel to change a broken hose without having to remove good hoses in order to get to it. This combination of fewer failures and faster maintenance "boosts uptime, and thus productive capacity, by over 50%," says Kraicji. Slashing the number of hose fittings, plus the metal removal involved in cutting the runner system, lead to weight savings. But that was only the start. "We cut pockets in the tool's aluminum plates, getting rid of excess aluminum that wasn't needed for its structural integrity," says Eversole. In addition, the team took a close look at the tool's four stainless steel rods that acted as shut-off valves or petcocks to open and close the flow of icing. After some brainstorming, it became clear that with the aid of some design changes, two rods could adequately perform that valve function, eliminating two stainless steel rods and further reducing weight. As a result, the new two-color icing tool can now be used on Freed's other, lighter machines if the need arises, giving the company the flexibility it had long desired but never had. The new, lighter, tool also draws less energy as it goes through its motions, a benefit of growing importance as 21st-century companies grapple with higher energy costs. Then there was the problem of icing leakage or "color bleed." The nozzles had to be screwed into the icing tool assembly, lining up perfectly with the ports. Trouble is, this often didn't happen, resulting in icing leaking within the equipment and sometimes into the other color. This was a source of downtime, material wastage, and quality concerns. The 3-Dimensional team tackled this problem by tapering the top of the plastic cylinders in the icing heads that channel the icing. This provided a tight seal when the screws were tightened. They also designed in a 0.010-in. gap between the plastic cylinders and the pocket in the plate above them to ensure that the seal occurs on the taper. "The end result of all this is an icing tool that is lighter, more flexible, and more productive," says team member Scott Duffie, senior sales engineer. It is also more energy efficient, with higher quality and reduced material usage; needless to say, Freed's approves of 3-Dimensional Services work. And as for the team that created the new tool, they have now had several opportunities to sample their client's cupcakes and report that they approve of Freed's work as well. The 3-Dimensional Services Group consists of 3-Dimensional Services, Urgent Plastic Services, and Urgent Design & Manufacturing. Their capabilities include injection molding and casting, stamping, CNC machining, robotic and manual welding, laser cutting and welding, waterjet, hydroforming, tube bending, vibration welding, casting and pattern fabrication, RIM tooling, SLA, LOM, and SLS rapid prototyping and assembly.